SPANGLER – the Plus of Safety. Work underground does not only mean mining. The drilling of underground pipes is no less strenuous than mining mineral resources; as with conventional tunnel drilling machines with so called “open shields” the machine operator sits directly in the drill head. Only there do they have a full overview, however they are exposed to high temperatures, dust or even flying particles from the degraded ground. When working below the water table he is even exposed to a considering air overpressure as a protection against the infiltration of ground water. SPANGLER Automation has now succeeded, on behalf of Max Bögl, despite long distances and tough working conditions, in developing a remote control for these operating conditions. “The background to this lies in tunnel drilling work in flint with a ground water pressure of 1.5 bar in chalk cliffs with accumulated flintstone shifts.”, says Project Manager, Daniel Götz. This is too dangerous as a human workplace: the brittle rock splinters and the spalling acts like shrapnel. Instead of a machine operator, six cameras are situated in the drilling head in front of the lock screening the overburden area, which is under pressure, from the drive and control unit of the machine. A twelve-filament glass-fibre cable transmits the images as light signals to the control stand 1.2 km away. Depending on the location of the operator, three transceivers pick up the signals of a radio control and transfer these to the control unit using a fibre optic cable. In this process, safety is of the utmost importance with appropriate safety circuits: depending on the fault, either only the drilling head is disconnected, or the complete system. Acceptance of the signals from the radio remote control in the control stand. 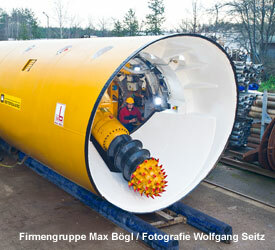 Front view of a tunnel drilling machine with drilling head.